We love fettuccine alfredo, but the regular version has so much fat and calories that we can't eat it very often! This recipe gives you lots of flavor in a creamy sauce but without all those calories. Sometimes I throw in a can of tuna like the the original recipe, but I have also substituted 1 cup of chopped, cooked chicken breast or 8 oz of cooked shrimp and it was delicious. Also, I find that even though the sauce is very full of dairy Jake can still eat it (Lactaid assisted), without becoming sick, unlike the usual cream version. This dish doesn't hold well-it's best eaten right after you've made it. Cook the pasta according to directions. Drain. Whisk the milk and the flour together in a bowl and pour into the garlic butter. Stir and cook gently for about 4-5 minutes until it thickens up a little and bubbles. Turn the heat to low. Add the Parmesan cheese, basil salt and pepper. Continue to stir while the cheese melts (the sauce will thicken at this point). 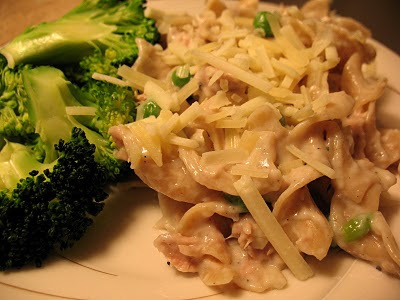 Stir in the sour cream, tuna, and peas, continuing to stir and cook gently on low until it's heated through. Toss with the pasta and serve.